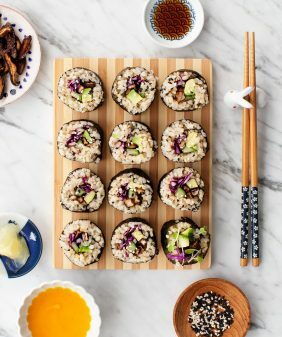 This healthy brown rice sushi recipe is a great choice for a date-night-in! Filled with cucumber, mango & creamy avocado, it's simple, yet delicious. We love sushi. We love it so much that we rarely make it at home, well, because Uchi is just down the street. But this sushi recipe is a great kitchen project to do with your significant other when you’re looking for something fun to do. Also this version is much less expensive! The only thing required for “sushi date night” is a bamboo mat and a positive attitude. You need to be in the kind of mood where you can laugh at each other when you get brown rice stuck all over your fingers and when your rolls don’t turn out perfect but they’re delicious anyway. Here is our version of not-perfect vegetarian sushi. When I was making this brown rice sushi recipe, I thought of one of my favorite unexpected ingredient combinations, originally inspired by the vegan sushi rolls they make at our Whole Foods. 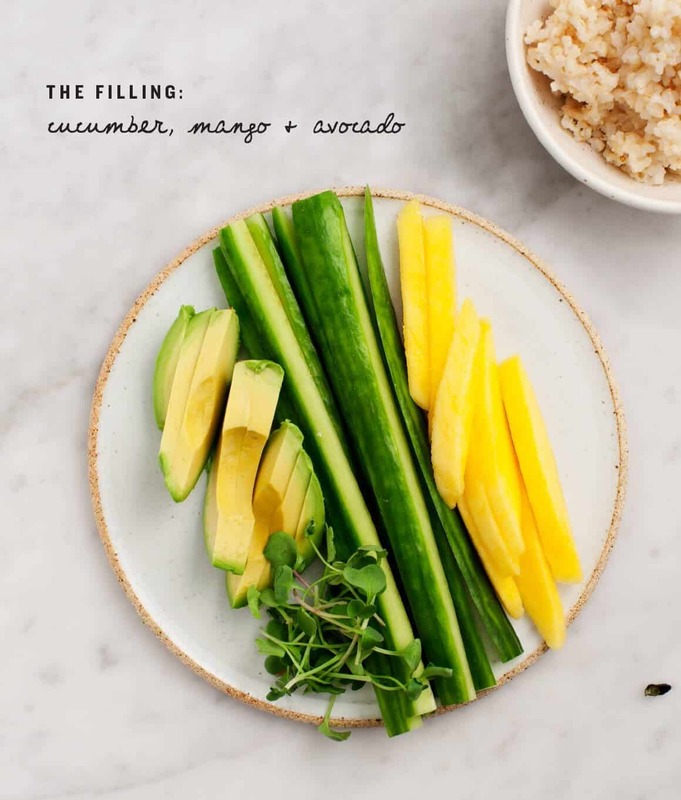 Together, crispy cucumber, sweet mango, and creamy avocado are so simple & so good. 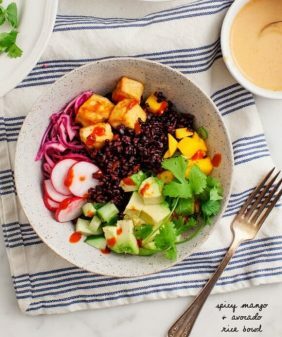 I’ve even used it as inspiration before – last year, I made this deconstructed “rice bowl” version. If you’re not into rolling your own sushi, that recipe is for you. Combine the rice and water in a rice cooker and cook on the brown rice setting. If you don’t have a rice cooker, combine the rice, water and 1 teaspoon of olive oil and bring to a boil. Cover, reduce heat, and simmer for 45 minutes. Remove the rice from heat and let sit, covered, for 10 more minutes. Fluff with a fork. Meanwhile, in a small bowl, combine the rice vinegar, sugar and salt. Heat it in the microwave for a few seconds to allow the sugar to dissolve. Prep the filling ingredients for the rolls and set aside. Place a small bowl of water and a kitchen towel near your work area as your hands will get sticky. 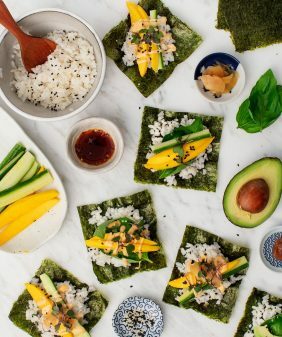 Place one nori sheet, glossy side down, onto a bamboo mat and press a handful of rice onto the lower two-thirds of the sheet. At the bottom of the rice place your toppings (see picture). Don’t overfill or it will be more difficult to roll. Use the bamboo mat to tuck and roll the nori. Once rolled, use the bamboo mat to gently press and shape the roll. Place the roll to the side, cut side down. Repeat with remaining rolls. Use a sharp chef’s knife to cut the sushi. Wipe the knife clean with a damp towel between cuts. Serve immediately with tamari or ponzu sauce and coconut peanut sauce, if using. What a great combination of flavors! I love the idea of rolling your own Sushi. Very brave of you. Not sure I would have the patience, but I want to try it!! Mango is so good in a sushi roll. I wish more rolls had it! Ah this is my favorite sushi combination! I’m so glad you shared a recipe for it!! It’s definitely time to find out if I have some hidden sushi rolling skills. 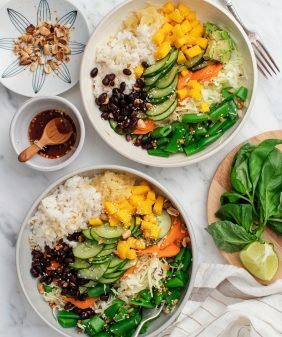 If not deconstructed rice bowls will be the way to go! I just purchased a new sushi set and I’m excited to use it making this yummy recipe. This looks wonderful although I’d have to replace the avocados (tear!) because of my intolerance. Wonderful recipe! 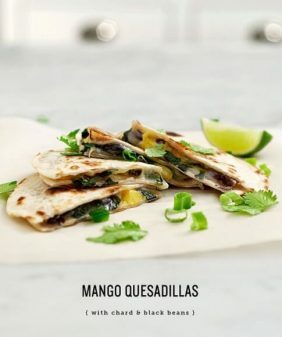 Thank you for sharing a lot of amazing recipes. I just purchased a new rice cooker, so the first try will be the rice for sushi in this recipe. This is exactly the recipe I wanted! I tried the whole foods avo cucumber brown rice maki last week and fell in love, so this is perfect! I like how this sushi is cute and has a bit of bright color! Oh my, these turned out great! I added a little mirin to the mango, and that give it just a little more ‘pop.’ This is my new favorite veggie sushi, and I’m sure I’ll make it often. Thanks! 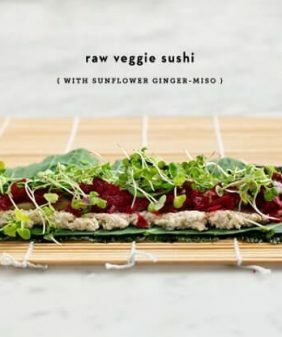 I have REALLY been craving sushi, but I prefer brown rice sushi for more nutrient-dense rolls! This looks amazing, and I definitely have to try it! This sushi looks amazing!!! I love making sushi at home with my sushi making tools because it is much cheaper than at the restaurant and so much fun too. 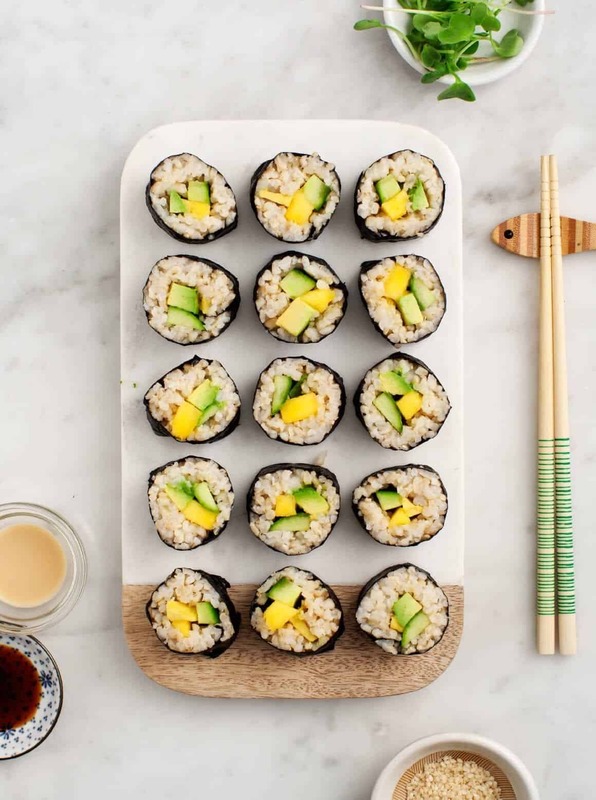 I hope I can make the perfect avocado & mango brown rice sushi for my kids with the help of this article. Thanks for sharing such an amazing sushi recipe. Sushi looks very tasty and yummy..!